In the early 20th century, a curriculum known as nature study flourished in inner city urban environments, streetcar suburbs, small towns and even rural one-room schools. 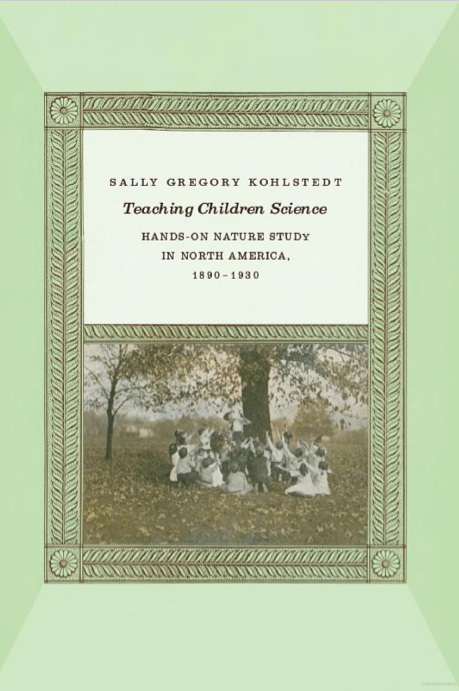 This object-based approach to learning about the natural world marked the first systematic attempt to introduce science into elementary education and came at a time when such institutions as zoos, botanical gardens, natural history museums, and national parks were promoting the idea that direct knowledge of nature promoted individual and community benefits for an increasingly urban populace. Administrators and the public endorsed themes that ranged from a nostalgic world of aesthetically pleasing and benign plants and animals to the assertion that learning to observe and use the natural world would be critical for pupils coming of age in a more modern, scientific age. The growing professional cadre of academic educators promoted nature study through on-campus schools, summer programs, textbooks, and public speaking. Critical to the implementation of the new curriculum were teachers—primarily women—who embraced nature study both as an opportunity to bring their creativity to the classroom and as a means to encourage their pupils to explore the world around them. Some successful women created a niche as nature study supervisors in large school systems and were able to design terrariums and window boxes; guide trips through parks, nature preserves, and museums; and organize vegetable and flower shows to demonstrate the effectiveness of the curriculum. By the 1920s the rich diversity of nature study programs no longer sat easily with an increasingly standardized curriculum. By that time, however, nature study was moving beyond schools into summer camps, afterschool activities, and the scouting movement. Its school legacy is sustained, however, in the living plants and animals in classrooms and environmental fieldtrips that remain central parts of science education today. Teaching Children Science is now available from the University of Chicago Press.